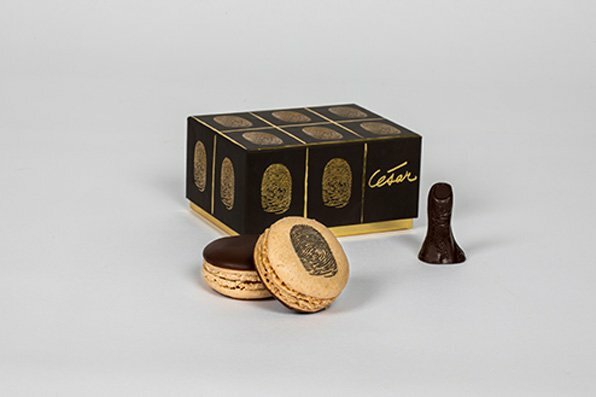 On the occasion of the César Retrospective from the 13th of December 2017 to the 26th March 2018 at the Centre Pompidou, Ladurée created an exclusive collection in his honor, composed of chocolate sculptures and macarons, inspired by his emblematic work, Le Pouce. This retrospective marks the 20th anniversary of the artist’s death. Famous by the age of 25, César enjoyed an artistic career of more than 50 years. He is, however, the last major figure among the Nouveaux Réalistes (New Realism) not to have been accorded a retrospective at the Centre Pompidou. Through more than a hundred pieces displayed in the largest of the Centre Pompidou’s exhibition spaces – among them the most famous of his major works, as well as representatives of lesser-known series – this exhibition will offer an unprecedented overview of the career of one of the greatest sculptors of his time, in all its diversity and coherence. Born in Marseille in 1921, César began his artistic education there before attending the École Nationale Supérieure desBeaux-Arts in Paris. In the French capital he met Alberto Giacometti, Germaine Richier and Pablo Picasso, among others, and frequented the artists of Saint-Germain-des-Prés and Montparnasse. He very quickly attracted attention with a distinctive personaltechnique, the welded iron of the human, animal and insect figures that gained him his first solo show, held at the Lucien Durand gallery in 1954. He soon found himself famous, his work exhibited in London and New York. At the height of his fame at the turn of the 1970s, César was an emblematic representative of the art of his time. Associated with France’s New Realist movement organised around critic Pierre Restany since 1960, he showed all over the world, creating expansions in public at events that were equally performances. From Paris to São Paolo and from London to Milan, César allied the permanence of the Classical tradition with radical and inventive interventions, often spectacular and ephemeral. Rejecting the shibboleths of both classics and moderns, he developed an original approach that mediated between the intensity of the often unpredictable experiment demanded by the art of his day and the wisdom of the long-term that came from the patient and laborious practice of assemblage. From Paris to São Paolo and from London to Milan César allied the permanence of the Classical tradition with radical and inventive interventions, often spectacular and ephemeral. Rejecting the shibboleths of both classics and moderns, he developed an original approach that mediated between the intensity of the often unpredictable experiment demanded by the art of his day and the wisdom of the long term that came from the patient and laborious practice of assemblage. From 1965 he worked on a series known as 'expansions', and experimented with what were for him new materials, such as glass fibre and polyester resin. Le Pouce, made for an exhibition on the theme of the hand, was based on a lifesize cast of his own thumb, scaled up using the machines traditionally employed by sculptors to enlarge their works. César made several, increasingly large versions of this work. From 4.5cm to 12m, Cesar spent his life playing on materials and scales. 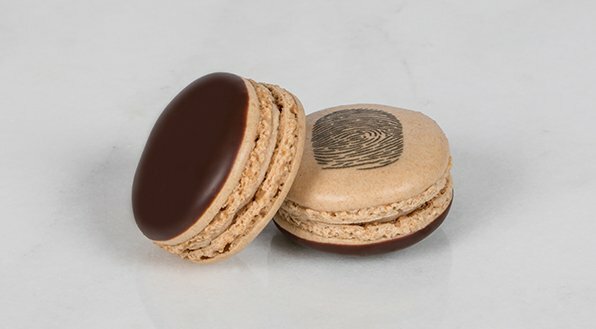 That’s why Ladurée offer César the opportunity to made a new version of his “Pouce”, previously settled at many places around the world. Smaller and eatable this time, it’s a piece of work mixing art and gastronomy, two areas really close from each other.